Going to a tiny house workshop is the best way to learn all of the ins and outs of tiny houses, the problems you may face when building/living in one, and options for construction and systems design. Last fall, I had the pleasure of attending a workshop lead by Dee Williams of Portland Alternative Dwellings. I plan to attend more if I can. Maybe you’ll see me at one of the events below! Do you dream about building a tiny house – a teeny tiny pad on wheels, built just for you? Do you dream about a little house in the backyard, or nested into a community of sorts, or resting out in the country where you can finally hear yourself think? Electrical, gas, and water systems. Join seasoned tiny house builder and designer, Jay Shafer, and experience a whole new way of thinking about house design and the spaces we live in. 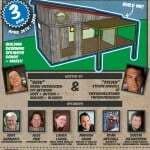 During this comprehensive 2-day workshop, Jay will share his unique subtractive design philosophy while walking you through everything you need to know to design and build your very own tiny house. There will be action-packed hands-on demonstrations and in-depth discussions about the best tools, methods, and materials for tiny house building. From practical planning and design tips that you can’t get anywhere else, to the building and construction knowledge you’ll need to see your project through to finish, we’ll guide you every step of the way. Ready to change the world? This is a unique opportunity to gain knowledge while sharing your ideas and experiences with other tiny house enthusiasts! If you dream of a tiny home, but aren’t sure where to start on your journey towards building your own, then join us at a Tumbleweed Tiny House Workshop, where you will gain knowledge you will need to build and design your very own tiny home. These workshops will revolutionize the way you think of space. Our two day Tiny House Workshop will teach you insightful and extensive information that you will need to build and create your very own tiny house; from picking the proper trailer, to selecting the materials you need, to helping you choose the right tools. We’re talking almost 35-40 hours of contact, building, demos, networking, and MORE! It looks like we’ll ALSO have a tiny house on wheels visiting us, courtesy of TENNESSEE TINY HOMES! We’re excited to meet builder Joe, and see what he’s done! This workshop will be a team up with Steven Harrell of Tinyhouselistings.com and Tinyhouseswoon.com – a THREE DAY, HANDS-ON, WORKSHOP where we’ll collectively build a tiny house! This will be another workshop that will be limited in size, so as to keep it intimate- 25 people or so is the maximum, so if interested, you might not want to wait too long on this.